Times of Zambia | Samsung Galaxy S8/S8+ the best looking phone ! Samsung Galaxy S8/S8+ the best looking phone ! What makes the Samsung Galaxy S8/S8+ standout? “Infinity display” What is infinity display? Infinity display is basically an edge to edge display screen made of curved gorilla glass layer which covers the LCD. The infinity display gives you a bigger, unobstructed view without a larger phone. The infinity display protects the phone and makes it easy to clean, in the sense that when someone leaves their gift of finger grease behind or specks of dust, it is really easy to wipe off without worrying about applied pressure. The infinity screen gives you more to see, binge watching and game playing with device gives you an uninterrupted, immersive experience. 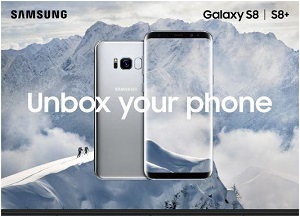 Samsung Galaxy S8/S8+ infinity display has set a new standard in mobile phone technology, expanded screen size, without increasing the size of the phone, giving you the scenes of your favourite series in your hands. Another amazing thing Samsung has done with the two devices is eliminating the physical buttons, which have been replaced with onscreen buttons that work perfectly. Samsung is really pushing the envelope in screen /phone design, with Infinity Display: a bezel-less, full-frontal, edge-to-edge screen, default resolution is Full HD+ that can be changed to Quad HD+ (WQHD+) in settings and screen measured diagonally as a full rectangle without accounting for the rounded corners. If you are thinking of upgrading to a distinctive sleek mobile device, the Galaxy S8/S8+ are a worthy upgrade.